Hi there! Glad to see back again. Christmas has come and gone, and the new year is here. I hope you had a wonderful holiday season and I wish you all the very best in 2016. The weather has been quite nice here in Alberta, a few days ago we started getting a bit of a west wind and well today the white stuff decided to come back and join us again. I guess someone decided to shake the snow globe again and give us a bit more snow. I been making a few cards and coloring a fair amount. So I decided to post this card that I made with a fantastic image from Miss Daisy Stamps called Guardian Angel. 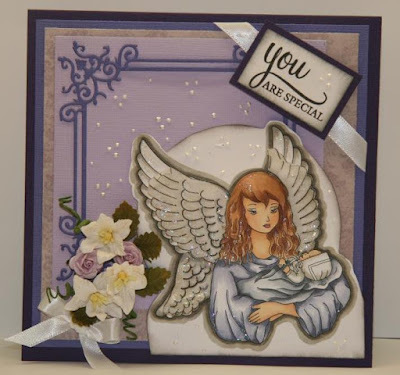 I choose to use a soft purple palette with this card to stay with the theme of angels. I made the wings with an overlay of vellum, just to try to give my card some dimension. I hope to see you back next week for another creation using another wonderful image of miss Daisy Stamps. Gorgeous, Charlene! Love your colour theme for angels. It's very pretty. The dimensional wings are a great idea! Beautiful designing!